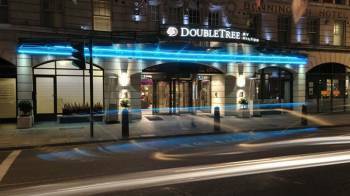 DoubleTree by Hilton Hotel London – West End is located in the historic district of Bloomsbury, convenient to London’s top tourist attractions and Heathrow and Gatwick Airports. Our London West End hotel is perfect for family breaks and the business and leisure traveler. Expect excellent service from friendly staff at our London West End hotel, waiting to welcome you with our signature, warm DoubleTree chocolate chip cookie. Our distinguished hotel, with its distinctive Edwardian façade, blends modern style with traditional charm.Unwind in our contemporary guest rooms, and watch your favorite movie on the flat-screen TV. Work at the spacious desk and keep in touch with complimentary WiFi throughout the hotel. Spacious duplex apartments feature dining areas, fully equipped kitchenettes and balconies.For business or social events, our London West End hotel offers flexible meeting space, professional banquet staff and creative menus. Our business center provides a complimentary printing service, A/V equipment rental, secretarial and video conferencing services. Start the day with our DoubleTree Breakfast Buffet. Relax and dine at the modern and contemporary Restaurant 92 located on the ground floor, overlooking Southampton Row. Offering a wide range of dishes combined with a quality service. Restaurant 92 creates the perfect surrounding for a relaxing evening meal or socializing with friends over dinner.